Weber (2012), 'WEC Technology Readiness and Performance Matrix - finding the best research technology development strategy', 4th International Conference on Ocean Energy, 17 October, Dublin. 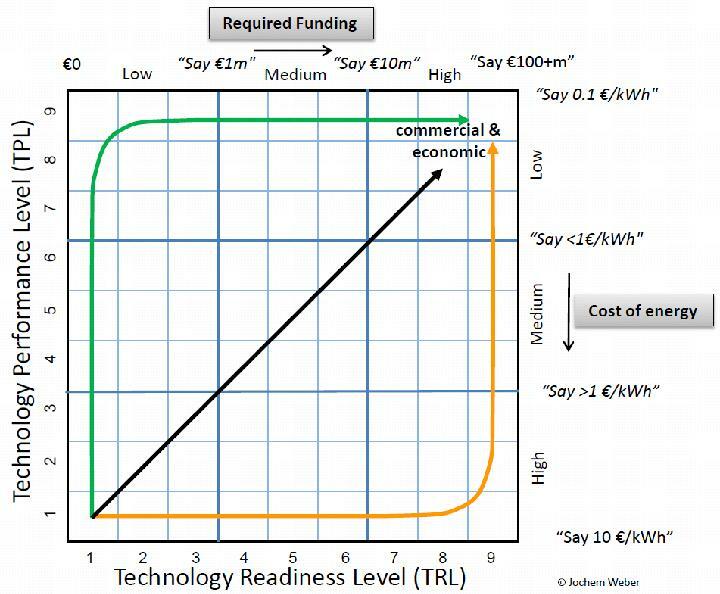 The technology readiness level (TRL) is the de-facto metric for describing the development stages of wave energy technologies. The TRL indicates a technology's maturity, and is strongly related to the amount of investment. Weber's paper proposes a second metric, the technology performance level (TPL). Arranged like TRL on a scale of 1 to 9, it measures a technology's economy, and is inversely related to the cost of energy. Readiness before performance: an example would be a concept chosen by intuition, demonstrated by a series of prototypes at increasing scale, the design modified only to solve operational problems that arise, and then when the technology is mature, applying this accrued knowledge about operational problems to radically different designs to improve economic performance or even to find a better concept. The problem with radically changing the concept at full readiness is that this violates the development protocols associated with TRLs. As research and design is conducted at larger scales, this path has a high development cost,time and risk. Obtaining funding is difficult because performance is low. The opportunities for improved performance on the back of the learning curve are limited, and apply to all technologies after they reach commercial maturity at TRL9. (estimated 15% improvement). Performance before readiness: an example would be iterative research and development at small scale, then freezing the design and rolling out a series of prototypes at increasing scales. This option has the potential to have a cheaper development trajectory than readiness-before-performance, but is difficult to achieve in practice. The problem lies in the large uncertainty in the TPL (i.e. cost of energy) at low levels of readiness. The performance before readiness trajectory is hindered by limitations of numerical and experimental modelling, and by the lack of foresight into mature system characteristics. Performance and readiness developed together: the line shown in Fig 1 is just an example; there is no reason why it should be a diagonal. A survey of current commercial devices placed their trajectories below the diagonal. Advice for industry: At low readiness the performance is uncertain and development costs are low, whereas at high readiness the performance is less uncertain and development costs are high. 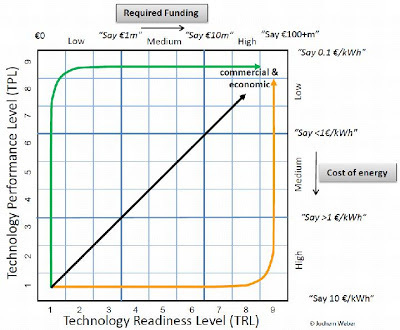 This suggests that technology development costs (high TPL at high TRL) would be minimised by keeping system fundamentals flexible at low TRLs (research phase) and fixed at high TRLs (development phase), resulting in a trajectory above the diagonal. Objective assessment at the research phase is crucial; this should be concept independent. High uncertainty at very low TRLs may result in overestimation of TPL early in the development process. An understanding of the technology at high stages of both readiness and performance is required to inform the evaluation phase: the final concept choice should be informed by empirical evidence and sub-system testing. Jochem's paper can be downloaded here. Conference presentation is available from Prezi.